Nelson Mandela Bay Stadium is a 48 000 seater stadium in Port Elizabeth. 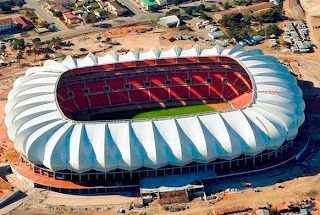 The five-tier, R2 billion (approximately US$270million) Nelson Mandela Bay Stadium was built overlooking the North End Lake, at the heart of the city. It is one of three coastal stadiums built in anticipation of the FIFA World Cup 2010 South Africa. It regularly hosts large scale football and rugby matches. The stadium has also been used as a concert venue. The stadium will host 8 games during the 2010 FIFA World Cup tournament. It will host 5 group games, as well as a round of 16 game, a quarterfinal and the 3rd/4th playoff will be played at the stadium.